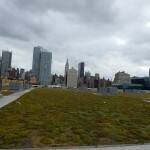 The Jacob Javits Convention Center is home to the second largest green roof on a single, free-standing building in the U.S. and the largest in NYC! The green roof was completed in October 2014 and is 297,000 sqft. It prevents approximately 6.8 million gallons of stormwater run-off annually. The roof features 14 different varieties of Sedum plants grown on a regional production farm in upstate New York. Read more about the roof from the designers.